this is the second time I have ordered the tea in the 4ox bags. My wife loves the convenience of just opening the bag and mixing it with distilled water. No muss no fuss. Cant brag about the taste but am doing it for health reasons, have stage 4 cancer in prostate and spine. been feeling pretty healthy and getting along good, and I feel the tea has helped that. I have been using the 1 lb of ESSIAC Blended Herbs for over a year now. My labs have been consistently improving and my doctor says keep doing what you are doing, as my CLL is now Pre-CLL. Love the prompt shipments and easy to use sealed packets! This tea has been a real blessing for my husband! His immune system has been stronger than ever and his cancer stats have shown steady improvement. Totally appreciate this valuable healthy product! This is the second batch of Essiac Tea that I have purchased. My original purchase was in smaller quantity since I wanted to try it out. I liked the health benefits that I experienced enough that I purchased my second batch in bulk because it was so much more economical. Shipping was prompt and my purchase arrived quicker than I expected. 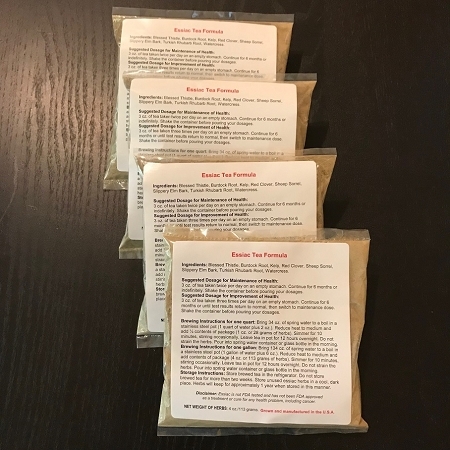 I have been using this product for several months now, I must say I was hesitant about its benefits but I cant imagine not having this tea as part of my daily routine,. I believe it has helped me manage my joint pain and quit smoking. I don't consider this a review but an interim comment. I was diagnosed with Leukemia about 5 months ago. One of the main symptoms of the disease is an increase in white blood cells. In deed my count has been increasing rapidly during that period effectively doubling each month. 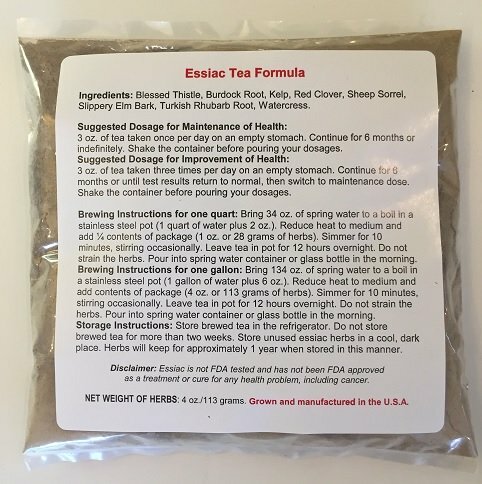 I started Essiac tea treatment (passing on chemotherapy or radiation) a little over 3 weeks ago (3 4 ounce cups each day). Now, in my most recent blood test the count has reduced by about 20%. Even the oncologist said, "whatever you are doing...keep doing it". We shall see what happens as I continue. FAST DELIVERY-DRINK IT FIRST THING IN THE MORNING-KEEPS OUR "ENGINES" RUNNING SMOOTHLY! !